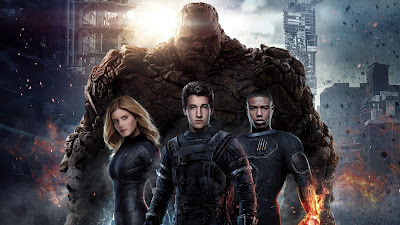 Josh Trank's Fantastic Four is currently bombing at the box-office. It is a $120 million dollar movie that will be lucky to accumulate half of that domestically. Critically it's at a 9% rating on Rotten Tomatoes with little to no positive things to say about it. As you can imagine, that is not really good. I love "not really good." So, of course, my interest has been peaked. I knew that this movie was going to be a mess, but I figured it would have its own pocket of loyal fans that are enjoying it. Nope. Even the people defending it aren't saying it's a good movie, the most positive thing said about it being that it's "not as terrible as everyone says." A buddy of mine who shares my affinity for terrible films said it wasn't the worst thing he ever saw, but that it was laughably bad at parts. How can something that has had so much friction from the announcement of its existence still tread the exact same territory everyone expected it to tread. How did they not try and prove everyone by giving them exactly what they wanted: an actual Fantastic Four movie! I didn't really find myself caring too much when it came to the black Johnny Storm debate. I liked Michael B Jordan all the way back to his Hardball and The Wire days, so I certainly wasn't upset about his being cast. Sure, changing his race seemed like a silly decision but it was one that I accepted and moved on from. Then they made the mistake of casting Miles Teller as Reed Richards. Don't get me wrong, Teller is a fantastic actor, as evidenced by Whiplash, but he isn't Reed Richards. He's way too young and lacks that character of Richards. Not once second during the trailers or TV spots did I get lost in his character. All I could see was a brash actor coming off a hot Oscar role. He wasn't putting forth any extra effort than he did in the Divergent series. It's a tough role to cast and one that they unfortunately got wrong this time around. I like the casting of Jaime Bell and Kate Mara as Ben Grimm and Sue Storm, respectively. They're both great actors and I thought that they actually fit the roles. Mara in particular is what I would envision for Sue, in that she has one of those faces that will always looks the same, regardless of age. That's always been Sue to me, for some reason. Plus, seeing how terribly miscast the role was in the Tim Story version, it's nice to see a little bit of coherence with what the character has always represented outside of looks. Apparently Doom is the worst part about it. I find this funny because Doom was easily the worst part about the 2005 version as well. Given that Victor Von Doom is one of the greatest characters in all of comics history, it's a little disheartening that he hasn't been fully realized on the big screen yet. Trank seemed like the man for the job, and I think Kebbel is a decent enough actor, so the fact that they created such an abomination out of what is essentially a character who only cares about power. So why do I want to see it? All of this seems to add up to what is so fantastically bad, it'll be putting me to sleep for the next few months. So really, I have to thank Fox because I'm always on the lookout for "so-bad-it's-boring" kind of movies. With how recent reports are sounding, it doesn't look like Fox is willing to part ways with Marvel's first family just yet so our hopes of Fantastic Four returning to Marvel seem to still be a pipe dream. Here's hoping that the X-Men TV Show that Fox is currently negotiating with Marvel for will offer up some insight as to what Fox's hold on the franchise is for the future. Until then, we just have to wait. And be disappointed. Very disappointed.